Adventure comic and various police cars. Homepage. This page: A brightly-illustrated post-war British comic featuring a number of classic vehicles on its cover. Police cars feature on Adventure comic. This, the motoring-related collectables section of OCC, features all manner of items - mainly printed - that relate in some way to the history of cars and other road transport. Amongst the random subjects to be found in this section are a variety of old children's comics, going back to the early years of the 20th Century and all with something in common, a motoring-related illustration - or selection of - within their pages or, as in this case, on their front cover. These include a copy of "Nelson Lee" from 1927, that features land speed record car "Babs" on its cover (Nelson Lee). More recent - well, from 1963 - is this copy of Eagle, its cover bearing a great illustration of Baron Emmanuel de Graffenried hustling his mighty Maserati 4CLT at an early post-war motor race at Silverstone. Pluck Magazine from October 13th 1923 also has an exciting motor-racing scene on its cover, albeit this time at the Brooklands circuit. Morris Minor "lowlight" police cars in action. 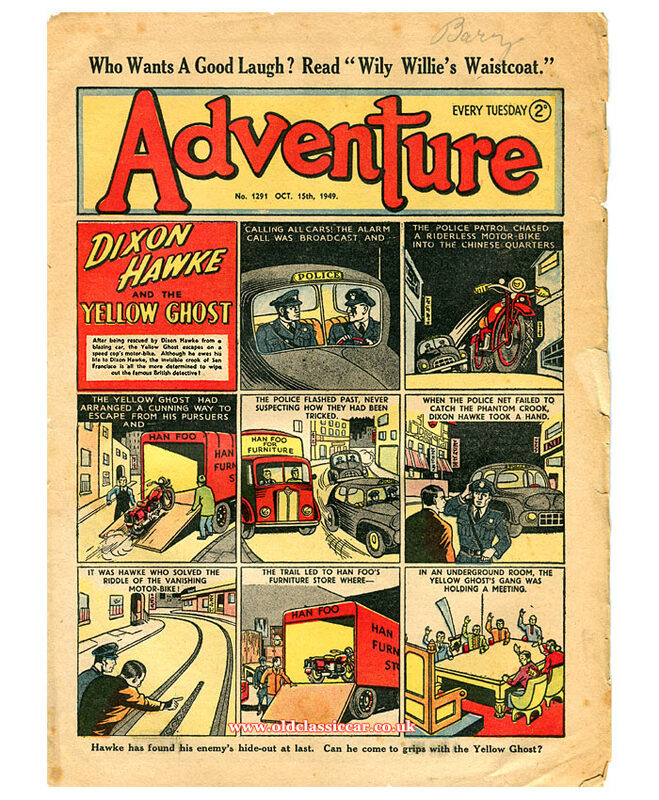 Whereas the previous examples given all feature real cars or venues on their covers, my sole copy of Adventure comic, dated October 15th 1949, provides the latest instalment of a long-running fictional story titled Dixon Hawke and the Yellow Ghost. Dixon Hawke was the comic-book detective with the British police force, while the Yellow Ghost in this story was his quarry. The mesmerised reader of this gripping yarn would have had to demonstrate towering levels of patience mind you, given that this particular story only features on the cover of the comic, there is no continuation of this particular tale inside, so updates would have been spread over many weeks. Still, the brightly-coloured illustrations and intriguing storyline no doubt helped maintain most fans' excitement as the weeks rolled by. The chisel-jawed officers of the law, or "cops" as they're referred to, are shown driving their plucky mounts at speed - cars that look suspiciously like early "lowlight" Morris Minor MMs (at the time a very up-to-date vehicle, given that the Issigonis-designed Minor had gone on sale just the year before*). The officers in the story were in hot pursuit of a seemingly-riderless motorcycle, which it turned out was being masterfully ridden by none other than the Yellow Ghost himself, right into the back of a waiting furniture lorry. The speeding police cars sweep by in haste, unawares that their foe was tucked away, chuckling, in the back of Han Foo's innocent-looking van. However ace detective Dixon Hawke was quick to figure out the cad's deception, the lorry's wheel tracks conveniently leading the police in their Morris Minors to Yellow Ghost's hideaway. * Period photographs of the early Minor MM may be found on this page. Only the cover of this comic features colour. Stories inside this 1949 copy of Adventure are as follows: Huck McFee - The Wild Boy Of The Backwoods, The Strangest Quest Of Strang The Terrible, They've Kicked Out Baldy Hogan, Wily Willie's Waistcoat, and a nature-related picture quiz. A limited amount of advertising can be found in Adventure's pages, the largest ad of which encourages boys at school leaving age to take up a job in Britain's coalmines. 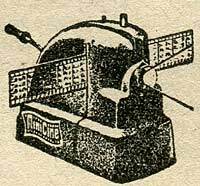 Smaller promotions refer to compasses, on sale with Signalling Equipment Ltd of Potters Bar, Wren's Dubbin to keep boots in "tip-top" condition, ex-army leather jerkins and paratroop binoculars and, of particular interest to me, a small ad from Martin Lucas Ltd of Lancashire for the Minicine, referred to as the Most Economical Projector. In the 1970s I went along to a garage sale taking place a few doors up from where we lived, and for a few coins of the realm I bought myself one of these compact cine cameras, complete with its box, finished in a black crackle-type paint, operated manually via a removable winder of the back. I wish I still had it. Return to the Motor Collectables section to find many more pages relating to classic cars and other vehicles in some way, not forgetting of course quite a few other old comics that bear appealing old scenes, of a motoring flavour naturally, either on their covers or within their time-worn, well-thumbed, pages.